Antimony Sulfide (Sb2S3) is a semiconductor ceramics belonging to V-VI group of periodic table, which have high thermo-electric power and photosensitivity. Sb2S3 has a wide range of commercial applications in microwave devices, optoelectronic devices and solar cell absorber [1-4]. Sb2S3 fulfils the optoelectronic properties to obtain an electronic band gap in the near-infrared region and the visible region, depending on its crystalline or amorphous nature . Sb2S3 is an important photoconductive semiconductor in the polycrystalline form as orthorhombic crystal structure. The optoelectrical properties of Sb2S3 such as charge carrier transport mechanism, conduction, photoelectric properties makes it a promising material in solar energy industries as a light absorbing material. For solar cell absorber applications, the absorption coefficient and the energy band gap of Sb2S3 plays a crucial role. It is already reported [6-7] that higher absorption coefficient and lower energy band gap improves the performance of an absorber in the solar cell. Furthermore, the energy band gap in Sb2S3 is inversely proportional to its crystallinity  and the absorption coefficient of Sb2S3 is directly proportional to its crystallite size . Recently, Sb2S3 powders have been synthesized by conventional methods such as hydrothermal treatment, solvo thermal reaction, sonochemical method and high energy milling . The high energy milling has been frequently used by various researchers to produce nanocrystalline Sb2S3 . In the milling process, energy was normally provided in the form of mechanical or chemical means. Additionally, in conventional milling process many parameters need to be controlled for cost reduction such as power, ball diameter, contamination, time, etc. Therefore, high energy milling through biofield treatment could be a cost effective approach which can effectively modulate the crystalline and physical properties. Researchers all around the world have confirmed that the solid matter consist of energy and once this energy vibrates at a certain frequency, that gives physical, atomic and structural properties to the matter such as shape, size, texture, crystal structure, atomic weight, etc. Similarly, the human body also consists of vibratory energy particles like neutrons, protons, and electrons, and when these charged particles vibrate at certain frequency, an electrical impulse is generated. Consequently varying of these electrical impulses with time, cause generation of magnetic field as per Ampere-Maxwell-Law, which cumulatively form electromagnetic field . Hence, the electromagnetic field generated from the human body is known as biofield. This biofield often vary from person to person based on their physiology and internal dynamic processes. Mr. Trivedi is known for his unique physiology and biofield, through which he has already caused changes in the atomic and physical characteristics in various fields such as material science [9-16], agriculture [17-19], microbiology [20-22], and biotechnology [23,24]. Further, in the field of material science, the said biofield has significantly changed the lattice parameter, surface area, crystallite size and particle size in metals , carbon allotropes , and ceramics [13,15]. In this paper, we report the impact of Biofield on Sb2S3 powder with respect to its structural, spectral and physical characteristics. Antimony sulfide (Sb2S3) powder used in the present investigation was purchased from Sigma-Aldrich, USA. Procured Sb2S3 powder was distributed into five equal samples. 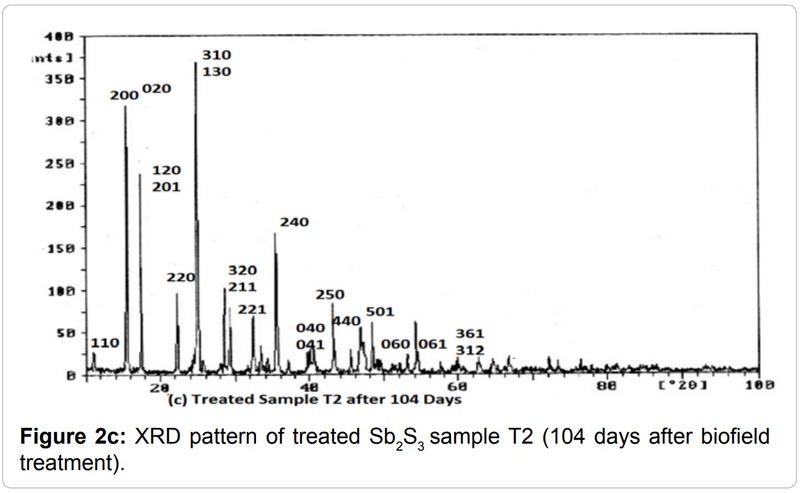 One sample was considered as control, and other four samples were exposed to Mr. Trivedi’s biofield, referred herein as treated samples (T1, T2, T3, and T4). All samples were characterized by X-ray Diffraction, Scanning Electron Microscopy (SEM), Laser particle size analyzer, surface area analyzer (BET) and Fourier transform infrared spectroscopy (FT-IR) analysis. Average particle size distribution and particle size were measured by Laser particle size analyzer SYMPATEC HELOS-BF, which had the detection range of 0.1-875 μm. The surface area was measured by using surface area analyzer, SMART SORB 90 Brunauer-Emmett-Teller (BET) with a detection range of 0.1-1000 m2/g. The atomic and structural level analysis was carried out using X-ray Diffraction (XRD), Phillips, Holland PW 1710. The copper anode with Nickel filter was used in this XRD instrument. The wavelength of radiation used in the instrument was 1.54056 Å and data provided by XRD was in the form of a chart of 2θ vs. intensity along with a table containing peak intensity counts, d value (Å), peak width (θ0), relative Intensity (%). For the calculation of lattice parameter and unit cell volume PowderX software was used. where k is the equipment constant (=0.94), and λ is the wavelength of radiation used. The molecular weight of a molecule is the sum of the atomic weight of all atoms, and the atomic weight is the sum of the total weight of protons, neutrons and electrons present in an atom. As number of molecules in a unit cell is fixed, so the weight of the unit cell was computed as the number of molecules present in a unit cell multiplied by the molecular weight of the molecules. The density was calculated as the weight of the unit cell divided by the volume of the unit cell. 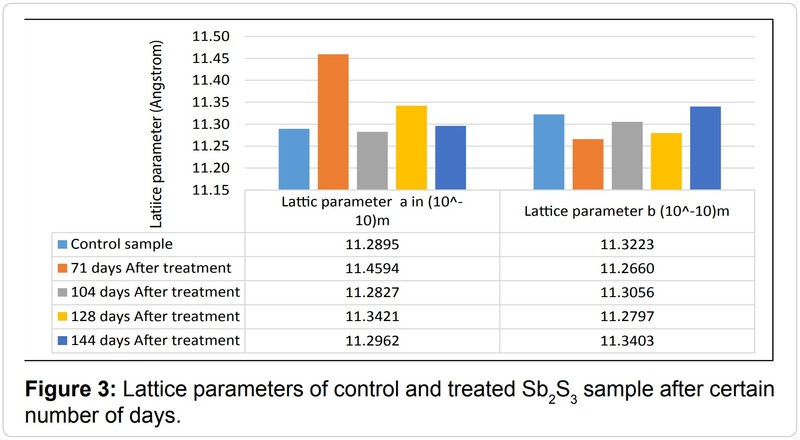 The percent change in lattice parameter, “a” was calculated as [(at-ac)/ac] × 100 where ac and at are lattice parameter of control and treated powder samples respectively. The percentage change in all other parameters such as lattice parameter “b”, unit cell volume, density, crystallite size were calculated in a similar manner. 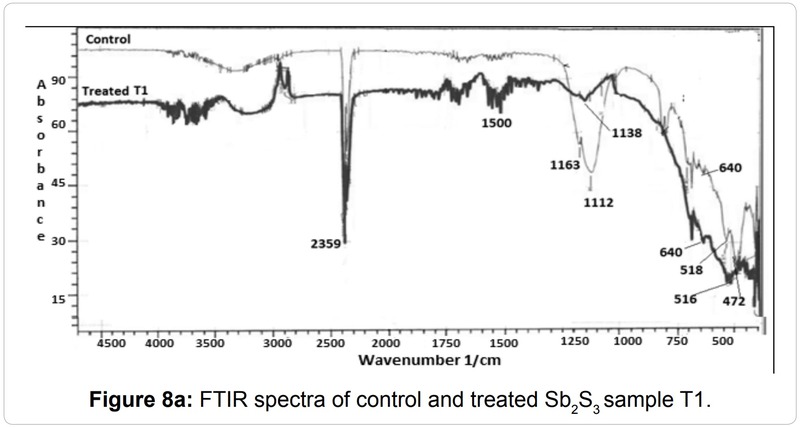 The IR spectra of samples were recorded by using Perkin Elmer, USA Fourier Transform Infrared (FT-IR) Spectrometer with frequency range of 300-4000/cm. For surface morphology observation, Scanning electron microscopy (SEM), the JEOL JSM-6360 instrument was used. 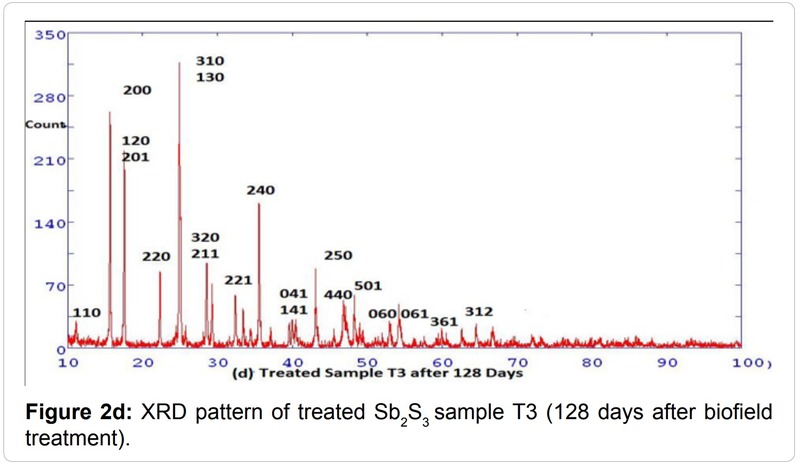 The particle size and surface area analysis of control and treated Sb2S3 sample T1, T2, and T3 is shown in Figure 1. The treated sample T1, T2, and T3 were evaluated on 12th, 86th and 94th day after treatment respectively. 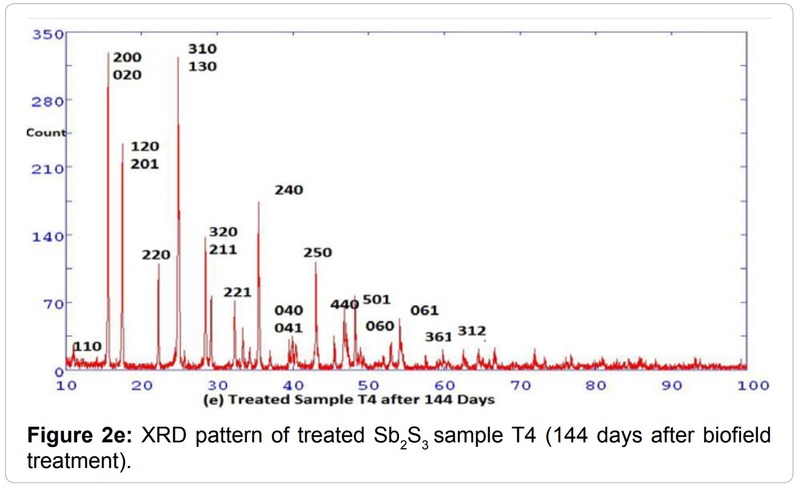 The particle size analysis results showed that the average particle size d50 was decreased in treated Sb2S3 samples by 2%, 9.7% and 8.5% as compared to control in T1, T2, and T3 respectively. 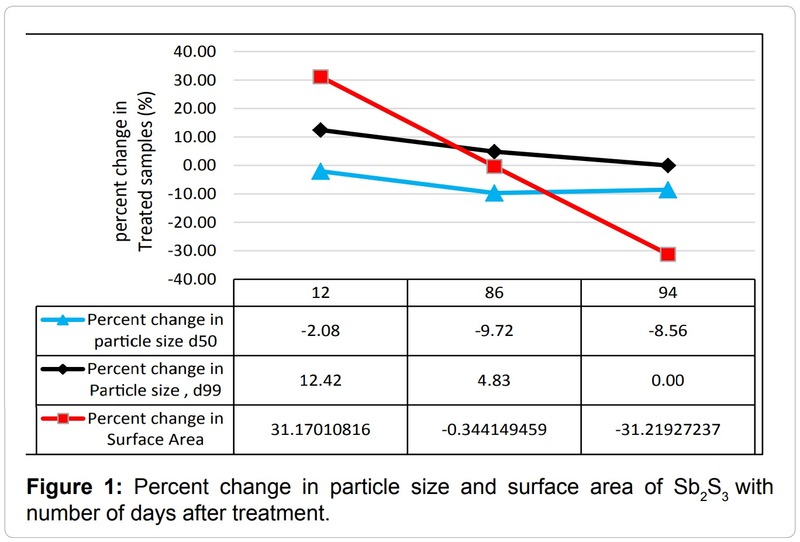 Nevertheless, the particle size d99 (size below which 99% particles are present) was increased in T1 by 12% and decreased in sample T2 and T3. Contrarily, the specific surface area was increased by 31% in sample T1 and then reduced by 31% in sample T3 as compared to control sample after treatment, though it was not changed in sample T2. The decrease in particle size was probably due to the fracturing of medium size particles into fine particles by energy milling that led to increased surface area in T1. The reduction in particle size and surface area in sample T3 was contrary to the fact i.e. smaller the particle size, larger the surface area. Thus it was postulated that, possibly the fresh surfaces of the particles were generated due to fracturing and agglomeration process through high energy milling. In order to get more insights about change in particle size and surface area, the powders were characterized by X-ray diffraction. The XRD diffractogram of Sb2S3 is presented in (Figures 2a-2e). 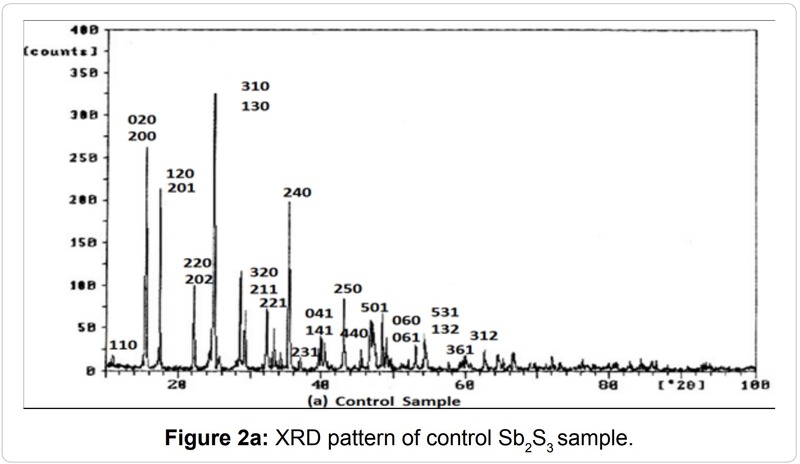 The XRD patterns of Sb2S3 confirms the orthorhombic crystal structure in control and all treated Sb2S3 samples as per JCPDS Card number 06-0474. 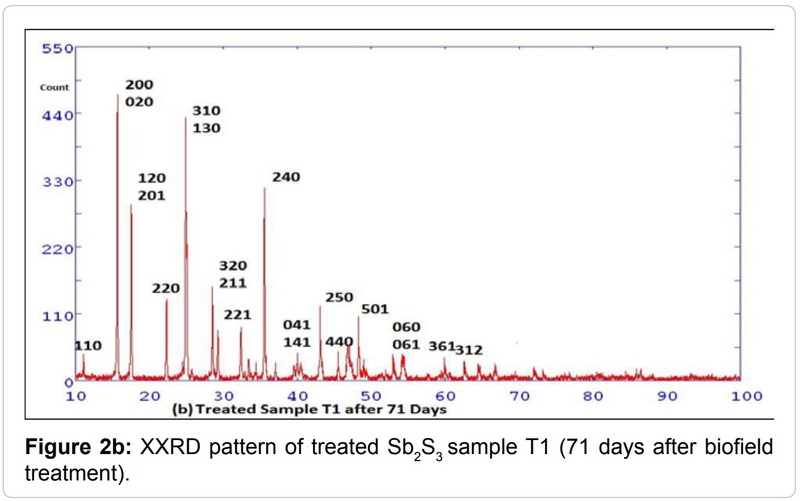 From the XRD patterns, it was found that the peak intensity in treated sample T1 (Figure 2b) was increased along plane (200), (310) as compared to control (Figure 2a). Further the treated sample T2 also showed increased intensity (Figure 2c). This indicated that the crystallinity was enhanced in sample T1 and T2 that might be due to re-arrangement of the atoms in long range order through biofield. However the intensity of major peaks were not changed in sample T3 and T4 (Figures 2d and 2e). Additionally, the crystal structure parameters were computed from the XRD patterns using PowderX software and analysis results are illustrated in Figures 3-6. It was observed that the lattice parameter “a” was increased from 11.28Å (control) to 11.45Å in T1 (Figure 3). 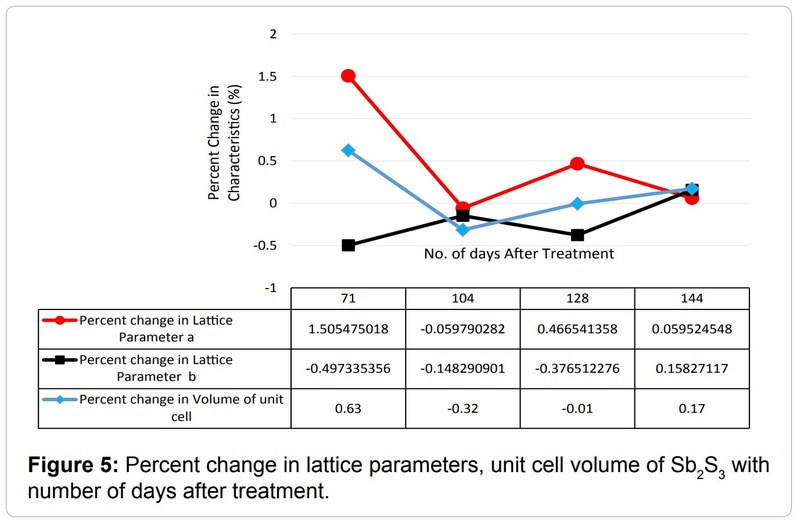 Further, the results showed that on 71th day after treatment (T1), the lattice parameter “a” was increased significantly by 1.5% whereas lattice parameter “b” was decreased by 0.5% as compared to control. This causes the corresponding increase in volume by 0.63% that led to reduced density by -0.61% as compared to control (Figures 4-5). The lattice strain (change in lattice parameter) along “a” was positive and along “b” it was negative, which indicated that tensile stress was applied along “a” and compressive stress was applied along “b” during milling through biofield treatment, which further implies that the unit cell expanded along one side and compressed along another side. 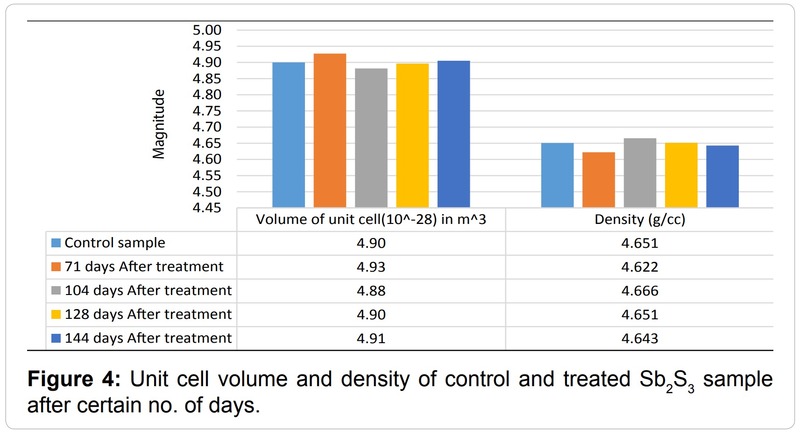 On 104th day after treatment (T2), no significant change was found in unit cell parameters. However, on 128th day (T3) unit cell parameter “a” was increased by 0.46% but parameter “b” was decreased by 0.37%, that led to no change in volume and density, since the volume increased through expansion of one side was compensated by compression in another side “b”. This suggest that stresses may have been applied on unit cell along both sides, “a” and “b”; and direction and magnitude of these stresses varied with time after biofield treatment. Thus, the varying stresses on unit cell led to change the corresponding volume and density in treated samples. Moreover on 144th day after treatment (T4), no significant change was found in unit cell parameters. 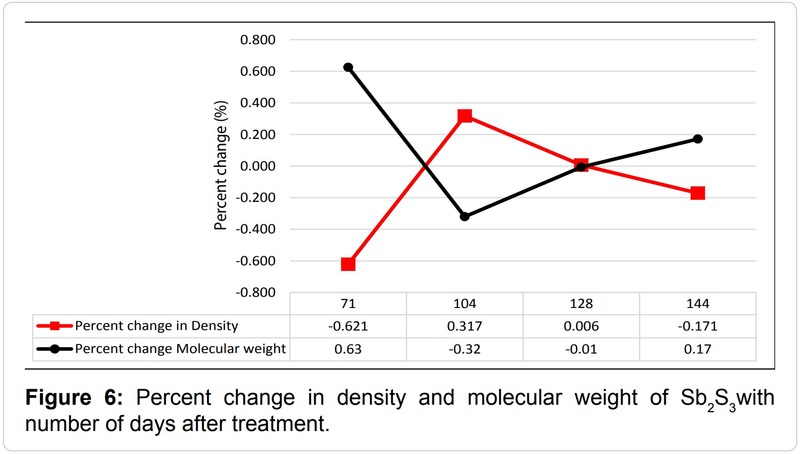 Further, the molecular weight changes were exactly opposite to the changes in the density as shown in Figure 6. This inverse relationship between molecular weight and density can be attributed to the change in proton to neutron ratio inside the nucleus. Furthermore the neutron to proton ratio can change if weak reversible nuclear level reaction occurs inside the nucleus. Thus, we presumed that biofield has transferred the energy in form of neutrinos that possibly cause this nuclear level reaction including proton-neutron to alter their ratio. coalescence of several grains, due to movement of crystallite boundaries. Nevertheless the movement of crystallite boundaries could be possible if a large amount of energy (at least one-third of melting point) was supplied to the crystallite boundaries (similar to grain growth during sintering of powders at high temperature). Hence, it is hypothesized that energy might have been supplied to the Sb2S3 either directly through the biofield treatment or via the weak reversible nuclear reactions. 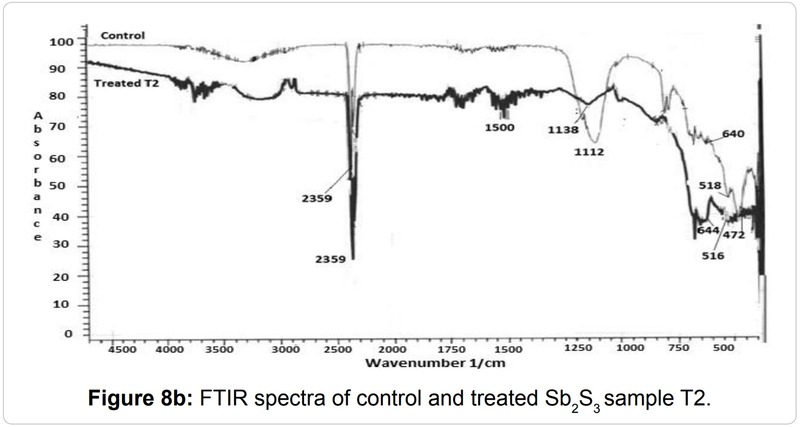 The FT-IR spectrum of control and treated Sb2S3 powder is shown in Figures 8a and 8b. The absorption peaks that were observed at 472, 518, 640/cm in control and 472, 516, 640/cm in T1 sample and 472, 516, 644/cm in T2 sample were attributed to the presence of orthorhombic crystal structure of Sb2S3 [25,26]. However, no significant change was found in absorption peak positions in the fingerprint region of 400–700/cm in treated samples. Nevertheless the absorption band intensity was significantly reduced at 1112/cm in both treated samples, T1 and T2, which may be due to change in inter-atomic interaction . The broad absorption bands in the region of 4000 to 2500/cm corresponds to the O–H stretch vibration peak due to the absorbed water. 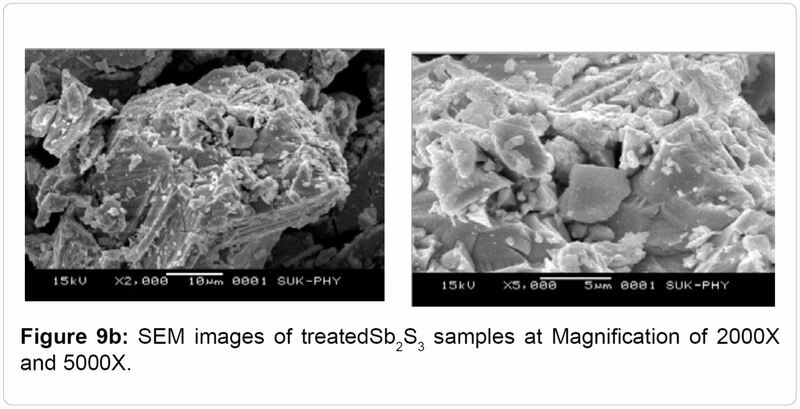 The surface morphology of Sb2S3 powder was studied using Scanning electron microscopy (SEM). 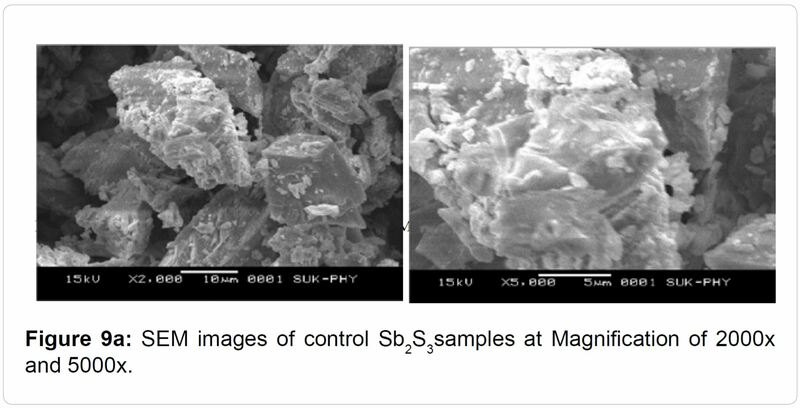 The SEM micrographs of control and treated Sb2S3 powders are depicted in Figures 9a and 9b respectively. The SEM images of control Sb2S3 powder showed the irregular shape with internal agglomerated boundaries and sharp corners on the particles. Contrarily the treated Sb2S3 samples looks dense, homogenized with an increased agglomerated size. The increases in agglomerate size in treated samples have also supported the particle size results. The agglomerated Sb2S3 particles in treated samples were appeared as plate-like shape on all around the outer surfaces, which led to increase in surface area. The structural, spectral and morphological studies revealed that the biofield treatment was acting on the structure, atoms, and their nuclei, which significantly affected the unit cell parameters, crystallite size, density, and molecular weight. Herein we report the influence of biofield treatment on Sb2S3 powders, and its structural, spectral and physical properties are investigated. The significant increase as well as decrease in particle size and surface area was found in treated Sb2S3 powder, which may be due to agglomeration, fracturing and welding process caused by high energy milling induced through biofield treatment. The surface morphology study by SEM showed internal agglomerated boundaries and sharp angular particles in Sb2S3 powder that was probably due to internal friction and high energy impact during milling. Biofield has significantly altered the both lattice parameter: a and b simultaneously in orthorhombic crystal structure of Sb2S3 powders. This indicates that volumetric stress was probably generated through biofield treatment that resulted into changed density and volume. The significant changes in molecular weight asserted that biofield treatment acts at the atomic and nuclei level. 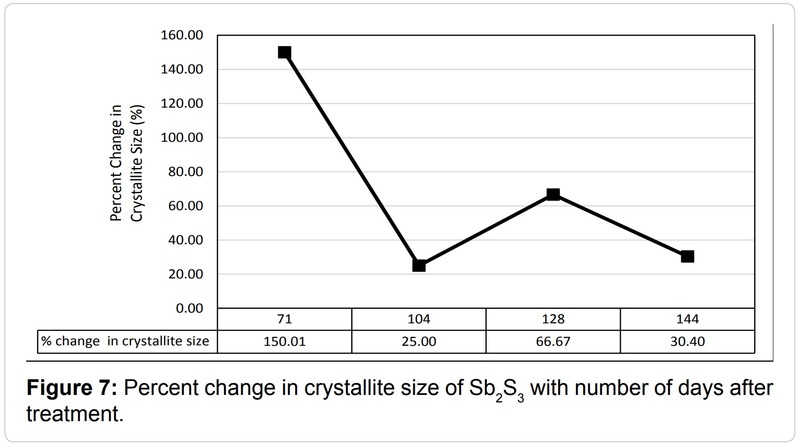 The crystallite size was significantly increased by 150%, indicating the improved absorbance of Sb2S3 after treatment. Additionally, the crystallinity of Sb2S3 powder was also enhanced after biofield treatment that may have led to reduced gap in energy band. Therefore, the novel treated Sb2S3 powder can play an important role towards better solar cell absorber applications. We thank Dr. Cheng Dong of NLSC, Institute of Physics, and Chinese academy of Sciences for supporting in using PowderX software for analyzing X-ray Diffraction results. 1. Tritt TM (1999) Thermoelectric materials: holey and unholy semiconductors. Science 283: 804-805. 2. Subramanian V, Siilvola E, Colpitts T, O’Quinn B (2001) Thin-film thermo-electric devices with high room-temperature figures of merit. Nature 413: 597-602. 3. Konstantatos G, Levina L, Tang J, Sargent EH (2008) Sensitive solution-processed Bi2S3 nanocrystalline photodetectors. Nano Letters 8: 4002-4006. 4. Rajpure KY, Bhosale CH (2000) Effect of composition on the structural, optical and electrical properties of sprayed Sb2S3 thin films prepared from non-aqueous medium. Journal of Physics and Chemistry of Solids 61: 561-568. 6. Ismaila B, Mushtaqb S, Khan A (2014) Enhanced grain growth in the Sn doped Sb2S3 thin film absorber materials for solar cell applications. Chalcogenide Letters 11: 37-45. 7. Ezema FI, Ekwealor ABC (2007) Optical Properties and Structural Characterizations of Sb2S3 Thin Films Deposited by Chemical Bath Deposition Technique. Turkish Journal of Physics 31: 205-210. 8. Maxwell JC (1865) A dynamical theory of the electromagnetic field. Philosophical Transactions of the Royal Society of Londo 155: 459-512. 9. Trivedi MK, Tallapragada RR (2008) A transcendental to changing metal powder characteristics. Metal Powder Report 63: 22-28, 31. 10. Dabhade VV, Tallapragada RR, Trivedi MK (2009) Effect of external energy on atomic, crystalline and powder characteristics of antimony and bismuth powders. Bulletin of Materials Science 32: 471-479. 11. Trivedi MK, Tallapragada RR (2009) Effect of superconsciousness external energy on atomic, crystalline and powder characteristics of carbon allotrope powders. Materials Research Innovations 13: 473-480. 12. Trivedi MK, Patil S, Tallapragada RM (2012) Thought Intervention through Biofield Changing Metal Powder Characteristics Experiments on Powder Characterisation at a PM Plant. Future Control and Automation 173: 247-252. 13. Trivedi MK, Patil S, Tallapragada RM (2013) Effect of Biofield Treatment on the Physical and Thermal Characteristics of Vanadium Pentoxide Powders. Journal of Material Sciences and Engineering S11:001. 14. Trivedi MK, Patil S, and Tallapragada RM (2013) Effect of bio field treatment on the physical and thermal characteristics of Silicon, Tin and Lead powders. Journal of Material Sciences and Engineering 2: 125. 15. Trivedi MK, Patil S, and Tallapragada RM (2014) Atomic, Crystalline and Powder Characteristics of Treated Zirconia and Silica Powders. Journal of Material Sciences and Engineering 3: 144. 16. Trivedi MK, Patil S, Tallapragada RMR (2015) Effect of Biofield Treatment on the Physical and Thermal Characteristics of Aluminium Powders. Ind Eng Manage 4: 151. 17. Shinde V, Sances F, Patil S, Spence A (2012) Impact of Biofield Treatment on Growth and Yield of Lettuce and Tomato. Australian Journal of Basic and Applied Sciences 6: 100-105. 18. Sances F, Flora E, Patil S, Spence A, Shinde V (2013) Impact of Biofield Treatment on Ginseng and Organic Blueberry Yield. AGRIVITA Journal of Agricultural Science 35. 20. Trivedi M, Patil S (2008) Impact of an external energy on Staphylococcus epidermis [ATCC -13518] in relation to antibiotic susceptibility and biochemical reactions - An experimental study. Journal of Accord Integrative Medicine 4: 230-235. 21. Trivedi M, Patil S (2008) Impact of an external energy on Yersinia enterocolitica [ATCC -23715] in relation to antibiotic susceptibility and biochemical reactions: An experimental study. The Internet Journal of Alternative Medicine 6. 22. Trivedi M, Bhardwaj Y, Patil S, Shettigar H., Bulbule A (2009) Impact of an external energy on Enterococcus faecalis [ATCC-51299] in relation to antibiotic susceptibility and biochemical reactions-An experimental study. Journal of Accord Integrative Medicine 5: 119-130. 24. Altekar N, Nayak G (2015) Effect of Biofield Treatment on Plant Growth and Adaptation. Journal of environment and health sciences 1: 1-9. 25. Yu SH, Shu L, Wu YS, Qian YT, Xie Y, et al. (1998) Benzene-thermal synthesis and characterization of ultra-fine powders of antimony sulphide. Materials Research Bulletin 33: 1207-1211. 26. Subramanian S, Chithralekha P, Pathinettam PD (2010) Enhanced electrical response in Sb2S3 thin films by the inclusion of polyaniline during electrodeposition. Physica B 405: 925-931.